The weather has been so great for gardening this spring. I’ve got all twenty-three of my hanging baskets planted and hanging. They are beautiful and full of promise for increased beauty. I had more than the usual dead perennials in the rock garden this spring. Almost all have been replanted. Certainly everything is doing well now. 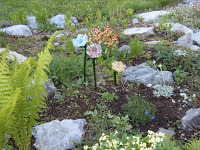 The picture shows the blown glass flowers that my son gave me for Mother’s Day. I think they go very well in the rock garden.